A simply delicious way to get the nutrients you and baby need from one little bottle, Bundle Organics prenatal juices are packed with organic fruits and veggies with an extra bump of essential vitamins for baby’s healthy development. Plus, our juices are pasteurized so you can sip worry-free! Our juices contain only the best and brightest organic fruits and veggies. Flavorless produce need not apply. You have enough to think about. That’s why our juices are 100% worry-free. “Raw” and “fresh-pressed” juices might contain harmful bacteria. So we pasteurize our juices for maximum nutrition, flavor, and pow! Our juices supplement prenatal vitamins with an extra bump of key vitamins and minerals for healthy development. Folic acid (200mcg). Check! Calcium (100mg). Check! Vitamin D (60IU). Check! Omega-3 (500mg). Check! Expecting moms should drink 8 to 10 glasses of fluid a day (that can seem like enough to fill a baby pool!). Luckily, our juices are a delicious alternative to plain ole water, leaving you feeling hydrated and oh-so-healthy. The first batch of Bundle Organics was made right in our kitchen, but we didn’t trust our taste buds alone. So we consulted with experts from OB-GYNs to leading nutritionists to make sure our juices were packed with all the right stuff – the nutrients and supplements that both mom and baby need. Check out our “About Us” page to find out more about the super smart all-stars behind our brand! Bundle Organics Prenatal Juice is the perfect way to help you and baby have a healthy pregnancy! I love that these juices are packed with vitamins and minerals to help support healthy development! 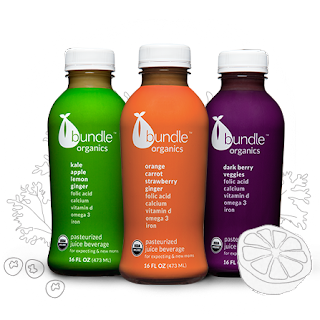 Bundle Organics juices are also organic which is so important when growing a baby. They also contain ginger which aids in that dreaded nausea most of us women suffer from during pregnancy. Bundle Organics Prenatal Juice is also great for nursing mothers, since we still need those added vitamins and minerals. I wish I'd have learned about these when I was pregnant because I suffered from Hypermesis (extreme morning sickness) and had no appetite whatsoever for about the first seven months of my pregnancy. I lived on smoothies, juices and soup. If I'd have had these super convention juices I would have drank them all day long because I'm sure they would have helped me with my nausea. Ginger is a great aid if your nauseous, but I was never able to tolerate the ginger tabs, candies, or ginger ale because the ginger was always so strong that it made me sick. Bundle Organics Prenatal Juice has a light ginger flavor that when mixed with the other flavors is masked very well. I loved each flavor and also love that they aren't overly sweet. If your suffering from morning sickness you've got to give these a try! I highly recommend Bundle Organics Prenatal Juice for all pregnant and new mothers!